Frances M. Drees Grilliot passed away 17 Feb 1988 in Sidney, Ohio. She was the mother of my husband's paternal grandmother, Naomi Grilliot Schroeder. Her funeral card lists her husband and all ten of her children. Frances's obituary was published in The Community Post of Minster, Ohio on 25 Feb 1988. 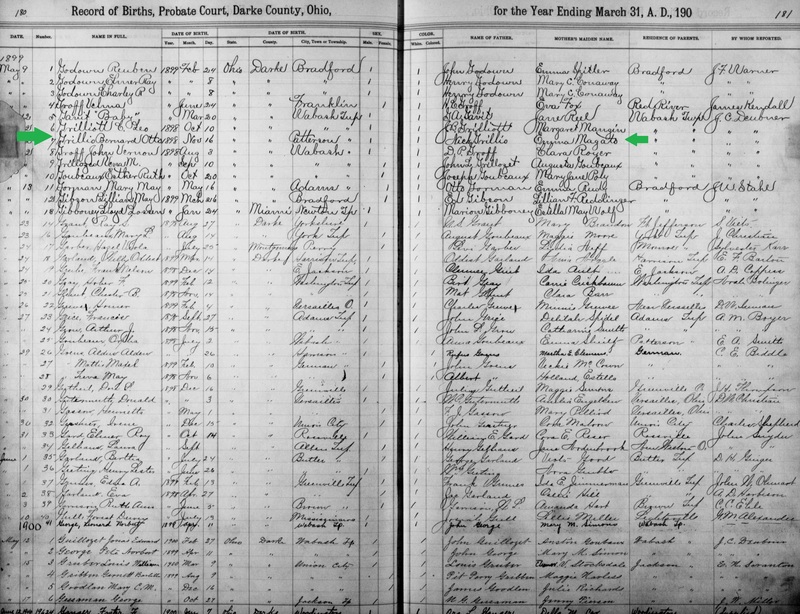 Birth Record Source: "Ohio, County Births, 1841-2003," index and images, FamilySearch (https://familysearch.org/pal:/MM9.1.1/X6ZX-TZR : accessed 01 May 2013), Frances Drees, 1900. For more information about the GRILLIOT Family click HERE. For more information about the DREES Family click HERE. Today, December 11, is the 90th birthday of my husband's paternal grandmother, Naomi Grilliot Schroeder. She was born December 11, 1924 near the small rural community of McCartyville, Ohio in Shelby County. Her birth was announced in The Minster Post on December 19, 1924. Naomi's parents were Bernard Otto Grilliot, son of Nicholas Grilliot and Amelia Magoto, and Frances Drees, daughter of J.M. "Mike" Drees and Mary Wilkens. She was the third of ten children born to Bernard and Frances. Bernard sold farming equipment and machinery in McCartyville. Naomi married Walter Schroeder on August 26, 1944 in McCartyville. They celebrated their 70th wedding anniversary this past August. Walter and Naomi have six children - five daughters and a son - and many grandchildren and great-grandchildren. The family came together last weekend to celebrate at Walter and Naomi's community home. The birthday gal wearing a crown. No, she didn't have to blow out 90 candles! Today, my husband's paternal grandparents, Walter and Naomi (Grilliot) Schroeder are celebrating their 70th wedding anniversary. They were married 26 Aug 1944 at Sacred Heart Catholic Church in McCartyville, Shelby County, Ohio. Both the bride and groom were 19 years old. The matron of honor listed, Mrs. Lawrence Jones, was Norma Mary Schroeder, Walter's sister. The maid of honor was Naomi's sister Ruth, and Norma's husband was the best man. (Walter, who had acquired the nickname 'Chub,' didn't have any brothers.) Here is a photo; it's a copy of a copy, so the quality isn't great, but I love using the descriptions in the newspaper article to get a better mental image of the clothing and flowers. The weather nerd that I am, I went to the National Climatic Data Center online and looked up what the weather was like at the nearest observation location, which was just north of Sidney, Ohio. It looks like it was a relatively "cool" day for late August; The high temperature was 74F and the low temperature was all the way down to 44F, which makes me believe that it was likely mostly clear and sunny. There was no rain. Walter and Naomi have lived in Sidney, Ohio during their entire marriage. They have six children; five girls and one boy. Grandpa is a WWII Army veteran and Grandma still makes the best cookies and enjoys crocheting blankets for her many grandchildren and great-grandchildren. They probably won't see this blog post, but I just wanted to let the world know that all of us in the family feel blessed to be a part of the family that they started 70 years ago. This is the tombstone of Bernard Otto Grilliot and Frances Marie Drees Grilliot, who were the parents of Naomi Grilliot Schroeder, my husband's paternal grandmother. They are buried in Sacred Heart Cemetery in McCartyville, Ohio (Shelby County). Bernard was born 16 November 1898 in Patterson Township, Darke County, Ohio. His parents were Nicholas Grilliot and Amelia Magoto, who were both Ohio-born children of French Catholic immigrants. Frances Marie Drees was born 28 December 1900 near McCartyville. She was the youngest child of J.M. "Mike" Drees and Mary Catherine Wilkens, who were both Ohio-born children of German-Catholic immigrants. Bernard and Frances were married 31 May 1921 at Sacred Heart Church in McCartyville. They had ten children, born between 1922 and 1940. Bernard ran a local farm implement business, which he later sold to his sons, Bernard "Buddy" and Tom Grilliot. Bernard Otto Grilliot passed away 24 February 1980 and Frances Grilliot passed away 17 Feb 1988. Photo Source: FindAGrave.com; photo taken by Joan Shoffner. The female attendants are Eleanor Drees, the bride's sister, and Ursula Hilgefort, who was the daughter of Frances's much-older half-sister, Katherine. Even though Ursula was technically her niece, she and Frances were nearly the exact same age, so they were probably more like sisters. Cletus and Magloire Grilliot were Bernard's younger brothers. During this time, the family used the 'Grillio' spelling of the surname instead of 'Grilliot,' because that made it easier for people to pronounce it correctly. Bernard's father, Nicholas, ran a local general store as well as a farm implement business. Bernard started his own farm implement business in the 1930s. Bernard and Frances had ten children - seven girls and three boys. They were married for 58 years. Bernard passed away in 1980 and Frances in 1988. Bernard and Frances were married by Fr. Edward Lehman, a familiar name to Catholics in the area even to this day. The main Catholic high school that serves the area around Sidney and Piqua, Ohio was named after Fr. Lehman in 1970. This is the Darke County, Ohio probate record of the marriage of Jean Nicholas Grilliot and Marie Anne Aubry, my husband's 3x great-grandparents through his paternal grandmother's line. Jean Nicholas and Marie Anne were both French immigrants whose families had immigrated to western Ohio in 1838 and 1840, respectively. Even though their birth villages were only a couple of kilometers apart in northeastern France, Jean Nicholas and Marie Anne probably did not know each other before settling in Darke County. At the time of the marriage, Jean Nicholas was 28 years old and Marie Anne was 18 years old. Darke County, Ohio Probate Marriage Record for Jean Nicholas Grillot and Marie Anne Auby. Jean Nicholas' surname is spelled 'Grillot,' which is indeed his birth name spelling. Somewhere along the way, an extra 'i' was added, making it 'Grilliot,' which is how it is spelled in his will. Marie Anne's surname at birth was spelled 'Aubry,' but 'Obry' is seen in many of her family's American records. This marriage record, as well as a couple of other other Grillot marriage records from 1852 to early 1853, state that the marriage was solemnized by a Justice of the Peace, NOT a Catholic priest. In fact, simply paging through the probate marriage records for these couple of years, it seems that the mention of a solemnization by a Catholic priest is rare, even for couples who are definitely French (and definitely Catholic). I am guessing that the small French community in the area had to go through longer periods without the presence of an ordained priest - perhaps they shared a priest with another community that was quite some distance away? Perhaps if that one priest suddenly passed away, they would have to wait even longer for a replacement. Whatever the case, the next step for me is to try to track down (if they exist) Catholic church records from the small parishes in this area of Darke County, to see if there ever was a church marriage for these couples who were 'officially' married by a Justice of the Peace. Darke County, Ohio Marriage Records can be at FamilySearch.org at this link. This photo shows the gravestone of Louis Grillot, my husband's 4x great-grandfather. As stated on the stone, he was born in Pareid, France, which is located in Northeast France's Lorraine region. In 1838, when he was 51 years old, Louis and his wife, Marie (Borin) Grillot packed up a few belongings and their seven (living) children, and sailed for America. They entered through the Port of New Orleans and made their way north to Darke County, Ohio, in the western part of the state. Ship manifest records indicate that Louis worked as a mason in France, but turned to farming in America. Louis passed away in 1861. He is buried in Holy Family Cemetery, Frenchtown, Ohio, along with many other French pioneers who settled in this part of Ohio. Joseph Schroeder was Grandpa's grandfather (my husband's gg-grandfather). As the article mentions, at age 78, he died of injuries sustained when falling off of a ladder after repairing a roof. (Information on his death certificate confirms this cause of death.) A "retired" farmer, he helped people maintain their homes and gardens, a profession he lists on the 1930 Census as "odd jobs." I'm sure that after growing up on a farm and then maintaining his own farm for so many years, he was used to physical labor, and that he probably even enjoyed it. He was also likely driven by his responsibility to continue to provide for his family; his daughter, Helen, was widowed when she was only about 28, and she and her three young daughters lived with him. Coincidentally, a week or so after I found that newspaper article, I found another one about an injury sustained to the grandfather of my husband's maternal grandmother. He was 71 at the time, a widower, lived with two of his sons, yet still was compelled to repair his barn. (The Minster Post, 11 Sep 1942). Regardless of the time period and/or location, EVERYONE knows or has known an elderly person who physically does more than he or she probably should. My grandfather, who lived as a widower for nearly 20 years, was notoriously stubborn about nearly everything. Fortunately, out of blind luck, he was never seriously injured from trying to shovel his (hilly) driveway or anything like that. My maternal grandmother, however, had a terrible fall down her basement stairs when she was living alone and broke her hip. I think that incident helped to convince her to come and live with us. It's human nature to want to continue to be able to do the things you've always been able to do, and it's difficult to admit to yourself that your body isn't what it used to be, especially when your mind feels just as young as it ever did. I believe that I am in a unique situation in which, as a relatively young person, I am able to understand how elderly people must feel when their reflexes get slower, muscles get weaker, joints get more painful, and/or their balance falters. As many of you know, I was born with a chronic vascular disease in my leg that progressively gets worse with age. Every few years, there is something physical that I find I cannot do (without pain) that I used to be able to do. I always go through the same mental process: I panic, I worry, I get angry, but then I ultimately accept it, because what choice do I have otherwise.? I try to direct my interests more towards those things that I still can accomplish. Most healthy, elderly people have not had a lifetime to come to terms with a failing body; either they come to that realization by suffering an accident OR they have to listen to their children, grandchildren, and doctors tell them what they can't do anymore. Hey, that would make me cranky, too. So, cut the old people some slack, let them know you love them and THAT'S why you don't want them to get hurt, and try to empathize with the underlying feelings of frustration behind all the outward stubbornness. Earlier this past week, I read an article on NPR.org entitled "Can Marriage Save Single Mothers From Poverty." The big statistic (as gathered from recent census data) is that a "third of families headed by single mothers is in poverty and they are four times more likely than married-couple families to be poor." My initial reaction was "Well...duh." Of course there is a better chance for a family to earn more money and be above the poverty level if there are two able-bodied workers in the home. I read a few more articles from other news outlets and "traditional" family-oriented organizations that discussed the same statistic. Not surprisingly, the more conservative, traditional family organizations hailed the institution of marriage as the obvious answer to solving the woes of families in poverty. And, of course, that got the online comment and debate boards rolling. In modern society, it's absolutely ridiculous to tell a single mom (or dad) to get married, or stay married in an unhealthy relationship, just to avoid poverty. (This is my opinion, but I think a lot of you would agree with me.) And many of the online comments reflected how extreme this option seems in the 21st century. How could you marry someone without being in love with them? Why would you take vows to stay with a person forever just because it will help you economically? And in today's world, it does sound absurd, BUT until relatively recently this WAS how single-parent families, especially those with young children, DID stay out of poverty. Let's go back, say, 150 years. You live in a small rural farming community. How did you meet your first husband? At church? Or maybe you attended the local schoolhouse together? Perhaps your fathers farmed land adjacent to one another. Considering how slow and difficult traveling long distances was at that time, most people tended to stay near their towns and most definitely within their home counties for their entire lives. Portion of 1875 Wabash Twp, Darke Co, Ohio Land Ownership Map. Marriages initiated by local neighborhood proximity were commonplace and even expected well into the 20th century, and not just in the rural areas. The addresses of my grandparents on their 1939 Cleveland, Ohio marriage license are literally right around the corner from each other. Of course, people still fall in love with and marry people they grew up with, but that phenomena is much less common than it used to be. Ok, so you are, say, 34 years old, living with your husband on your farm (which you may own outright or on which you may be paying a mortgage) and you have 6-7 kids. What happens to your family should you or your husband suddenly die? In a time when good hygiene and antibiotics didn't exist, disease and infection were all-too-common parts of life. In the mid 19th century, women were 40 times more likely to die from childbirth-related complications than they are today. Work-related accidents, whether on the farm or in a factory, took many parents' lives as well. Life insurance did not exist and many families only scraped by as it was, so there was no savings to draw from. There were no government-sponsored welfare programs; any assistance to families in distress originated from local neighbors and churches. Widows and widowers with small children usually found it necessary to remarry in order to keep their families intact and to keep food on the table. There were no such things as day care centers to watch the kids while mom or dad worked 12-14 hour days. Occasionally, neighbors or extended family members could help, but nearly everyone had their own families to support and sometimes they could not handle that extra burden. A struggling single parent would often be forced to send several of his/her children, some as young as nine years old, to live and work for other families as farmhands or house servants. Even if they were able to stay at home, other children would be forced to quit school in order to work on the homestead or find a job in the community. The death of a parent forced my grandfather's family to split up temporarily. My great-grandmother, a Polish immigrant, died suddenly of appendicitis in 1919 at the age of 29, leaving my great-grandfather with four sons between the ages of ten and five. In the 1920 census, my great-grandfather and the two oldest boys are living with a cousin and the third boy is living with another family. I cannot find my grandfather, the youngest, in this census, so I don't know where or with whom he was living. My great-grandfather remarried in 1921, at which point I know the brothers were reunited. Did all of these widows and widowers marry because they fell in love, or was it more because of the need to take care of their families? Old marriage certificates can't tell us that, so we'll never know for sure. It's unrealistic to expect single parents to do so today, but, if I ever did find out that one (or more) of my ancestors' marriages were for more practical reasons other than for love, I would not judge them or think less of them. They did what they had to do for their families and their livelihoods. Like most white Americans, husband and I are descendants of immigrants from European nations. My ancestors were from Poland, Croatia, and Italy, while his were from France and Germany. (Our kids are good ole European mutts, I guess :) Our relatives came over at different times, though, which made their immigrant experiences somewhat different due to improvements in technology and changes in American immigration legislation and processing. Conditions in steerage were usually quite bad. The quarters were cramped and unsanitary. Air circulation was poor and temperatures became dangerously hot during the summer months. People did not bathe and, at this time, were expected to provide their own food, which, even if properly "preserved" did gradually spoil. The stench was probably pretty awful. Passengers suffered from seasickness and other serious illnesses and injuries, and, unfortunately, there were occasionally deaths during the voyage. In 1855, Congress enacted a Passenger Act as an attempt to improve conditions for immigrants heading to America. It included provisions to limit the number of passengers per size of ship, increase the height of living quarters to at least 6 ft (it was usually 5.5 ft or less prior to this), provide adequate food, water, and ventilation, maintain a "quarantine" area for the sick and wash areas for all passengers, and provide some discipline to passengers who broke simple laws (theft was a large problem). There were fines if these provisions were not upheld; however, most historians agree that the law was not regularly enforced and the fines were not large enough to get every ship captain to adhere to the provisions. It was about this time that the first steamships started making Trans-Atlantic voyages. By the mid-1870s, dozens of steamships were regularly carrying immigrants from Europe to America. While conditions onboard these ships were still cramped and unhygienic (for lower class passengers), the length of the trips was signifcantly less: About 5-7 days from English/Irish ports and no more than 2 weeks from ports in central and southern Europe. My ancestors came to America between the 1890s and 1921, so they did have much shorter journeys. However, they also had to go through more red tape once they arrived at port, which included more thorough medical inspections, grouping procedures, and obtaining legal paperwork. Another post for another day, though :) I also intend to write about WHAT may have driven our ancestors to leave their homes and make a long, difficult, and dangerous journey halfway around the world to start new lives. residence, place to which he is going, occupation, and pieces of baggage. Once in America, he used name "Andrew Brunswick." It was fairly common for immigrants to anglicize their name, so keep that in mind when doing your own searching. There is a free site on which you can find some immigrant ship manifests. The Immigrant Ship Transcribers Guild is a network of volunteers who read through and manually transcribe original ship lists, which are then posted on the website. Because it relies on volunteer work, it is by no means a complete record of all ship lists, but I did find some of Tony's ancestors in their database, which is continually growing and being updated. Source Information: Ancestry.com. Baltimore, Passenger Lists, 1820-1948 and 1954-1957 [database on-line]. Provo, UT, USA: Ancestry.com Operations Inc, 2006.